Synopsis: An expansion of the universe from Robert Ludlum’s novels, centered on a new hero whose stakes have been triggered by the events of the previous three films. Review: As the 2012 Summer Olympics were drawing to a close, another torch was being passed in theaters across the country. When Matt Damon declined to return to the popular Bourne franchise the creators were faced with a dilemma: Recast Damon, abandon a profitable series, or kick start something in a new direction. Thankfully, wiser minds prevailed and instead of scrapping what has turned into an audience-pleasing run of films the producers have delivered a mostly fresh take on Bourne 2.0 that should keep its fans satiated (for now). Anytime a sequel readies for release I try to go back and revisit the preceding films so I’m up to speed with the characters and where they are when the last film ended. Sadly, with The Bourne Legacy I was strapped for time and missed taking in the Damon trilogy of Bournes and that put me at a small but not insurmountable disadvantage. You see, The Bourne Legacy takes place concurrently with the events of The Bourne Ultimatum so if you’ve recently seen that you might find yourselves putting the pieces together a bit faster than I did. It’s not to say that if you didn’t see any of the previous films that you’ll be lost but I can see it helping matters if you know what’s happening with Bourne while this new story is taking place. It’s hard to say that Renner is stepping into Damon’s shoes because he represents a totally new character, Aaron Cross, who finds himself in a situation not unlike the obstacles that Jason Bourne has faced over his silver screen lifetime. Basically, the plot hinges on the covert op team that recruited Cross trying to cover their tracks when information concerning the program falls into the wrong public hands. Shady Eric Byer (Norton) is the head of the task force hell bent on making sure that the deeper confidences of the company die with Cross. Cross is chased over several countries/continents that he travels between with Bond like ease. I’ve always found it interesting in these types of films that wanted men and women can travel internationally as easy as if they were walking down the street to buy milk. I know it’s their job to sneak in and out of places but can we once see them going through a TSA line…that would create some suspense, no doubt. The first half of the movie is told in slight parallel with Cross discovering that his company has betrayed him and a lovely geneticist Martha Shearing (Weisz) gradually figuring out her role in the grand scheme of things. Buckle yourself in for a lot of genetic discussions via rapid fire dialogue that would make the doctors in the early days of ER wince. It’s only after Shearing is nearly gunned down in a frightening lab massacre that the film really hits the accelerator and takes no prisoners. 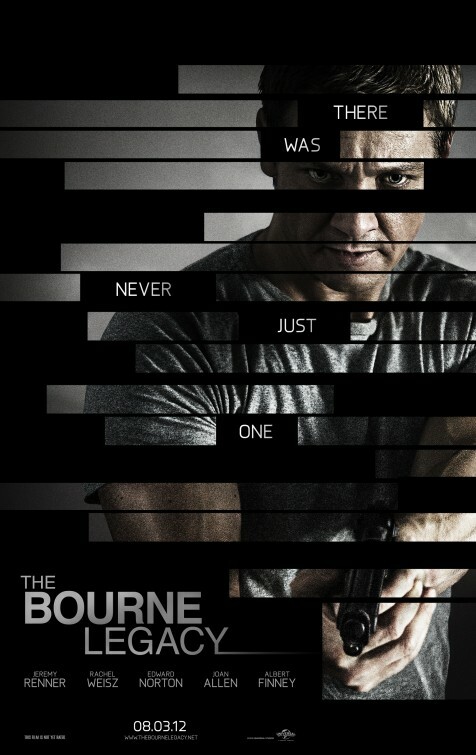 Weisz and Renner have a nice rapport and a way with director-screenwriter Gilroy’s tricky dialogue. As written, there’s not a lot of acting required of them but still they take the time to make the characters more than they are. Renner’s Cross is a haunted man that we only get glimpses of in this entry…leading me to believe his is a character that will develop across several films in much the same way Damon’s did. Weisz is surprisingly strong here with a role that might have gone wrong had she notched it a few more degrees in either direction . She’s rightly played it realistic making her easy to warm up to and follow throughout. I think she’s a little too easily swayed to do things at times but then again if I were in her position I’d follow any order that might save my life. The supporting cast is filled with reliable character actors that show up and do their jobs with verve. Norton knows how to play a conflicted company man and small turns from Keach and Murphy hit their mark. Fans of the previous films will recognize a few familiar faces but for the most part The Bourne Legacy wants to put the past behind them. Gilroy was responsible for the first three Bourne films and has crafted a swell little action film that flies by faster than it should. For the first time in recent memory, I was caught off guard when the credits started to roll because I wasn’t entirely ready for it to end. Ultimately, the film does have the whiff of being a ground-laying film for future Bourne films rather than shooting to be a superior stand alone film that a sequel could be, um, born out of. No matter, really, when the results are this pleasing. With the strong opening weekend and positive critical reception you can expect another Bourne to be rolling into theaters in short order.